My Weblog: Things I do instead of the housework. What a neat and lovely sketchbook you have! I usually have a hard time deciphering mine, even after a couple of days. I can't wait to see your finished products. Good luck with the kids's holiday! That beats housework any day! Can't wait to see what you come up with next! Hi! I found your journal and wanted to say hi. And sketching is definitely more fun than housework! I always love seeing excerpts from people's sketchbooks. The start of great ideas! Yum! Look at what comes out of your beautiful, talanted head! This page is wonderful. I'd love to see it made into fabric. Oh, I can definitely see those transformed into some kind of twill tape, note cards, embroidered on a skirt hem.... oh the ideas. Adorable. Your sketches would make the best fabric! Good luck creating your creature - do I ever wish I could visit Australia to see the Morphe show and see everyone's softies in person!! What a clean sketchbook! Thanks for posting it. I love to see other people's books. I could see that whole sheet in a project BTW. I would love it in a wrapping paper. I've never written to you before, my name is Mery and I'm a big fan of your blog and the beautiful things you create. Yes, I agree with the other you definetly must do something with your sketches, they are adorable! Fabric would be great and gift wrap paper and postcards or posters!!!!!!!! I'd definetly buy it =D ...you're so talented! I have sketch pages a little like that (different creatures come out of my head though-I don't think my head is as cute as yours) but I tell you what...the hedgehogs are adorable! The chibichibi and the little kids aswell. Just so cute! And Amanda's idea of stripes and spots works great in that elephant down in the left hand corner. Actually I love everything on there. Fabric, postcards, wrapping paper...you've got a page full of buyers here! Good luck and have fun creating for Morphe! Your sketches are too cute not to share! I'd love to watch a kid have fun coloring those. coloring book, postcards, fabric, yes, yes, yes! Your drawings are great and so cute! Thanks for sharing your sketchbook - it's always fascinating to see inside someone else's creative process. Can't wait to see some of the sketches materialise... they are all super cute! I can hardly wait to see what you make - all the sketches are too cute to choose from. And I love all the clever ideas, like the softie with a softie. THese are beautiful!! YOu have a lovely blog! I would definitely buy a fabric made from your sketchbook. It would work both in colours and in black/white! How about getting the sketches made into a tea-towel. That would be a very hip piece of cloth with which to dry the dishes. I'd buy one. you are a genius my dear!! Certainly beats housework - but unfortunately my house had got to the stage where something SERIOUS needs to be done! wow what great sketches. You have inspired me to get back to the drawing board. Plus you've made me crave an ice lolli now to boot! Sounds such much yummier than a popsicle. teehee! Cute sketches. Do you doodle when on the phone? I'm bad for getting off the phone and any piece of paper with in reach has some sort of sribble or picture. I must confess I seem to have the same problem... but somehow your sketchbook looks much more organized than mine. Those sketches are so cute!! I hope you don't mind that I printed it out for my son to color. He loves looking at hand-drawn animals, and this will save me from struggling to draw things for at least 2 minutes! hurrah! you've inspired me to forgo housework and do something creative tonight when i get home from work. thank you, thank you. Lovely sketches! I tend to do mine on backs of envelopes, because notebooks scare me now (I used to draw, but the other side of my brain took over when I became an academic... your page may inspire me to go back to it). Ohhhh look at that page, it is all so cute!!! I love every single little one!!! Love seeing your sketchbook... maybe I should break out of my fear of drawing and give this a try! Here here! for the bargaining (and bribery in our house!) method of parenting - without it, Brynne would never eat her dinner, I would never be able to have a quiet phone call, and we would never be able to get her out of the bathtub! What do you want to bet that the best negotiators are parents as well? 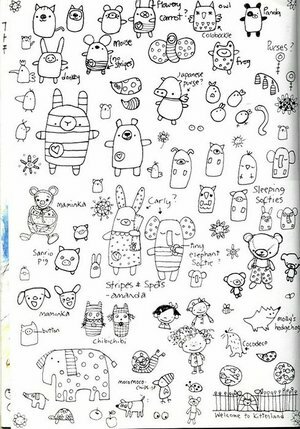 Your sketch book looks very fun and inspiring! If that's just a page from your sketchbook, then your sketchbook must be pretty amazing! Hehe, just how great is it to find 1,000,000 other things to do than doing housework or uni work... ; ). I think "finding-other-things-to-do-than-what-I-actually-need-to-do" is my best skill ; ). Nice blog and I totally adore the felt Panda. Think I am trying to do one as well. Oh, that looks like a page out of a perfect little coloring book! Love it.